Newly crowned omnium world champion Ed Clancy was in London today to see the first roof tiles being lowered in to position at the Olympic velodrome. The cycling venue will be the first to be completed on the site in west London as construction continues at a pace. 1,300 timber cassettes will be manoeuvred in to place over the next 11 weeks with the building being water tight in June. 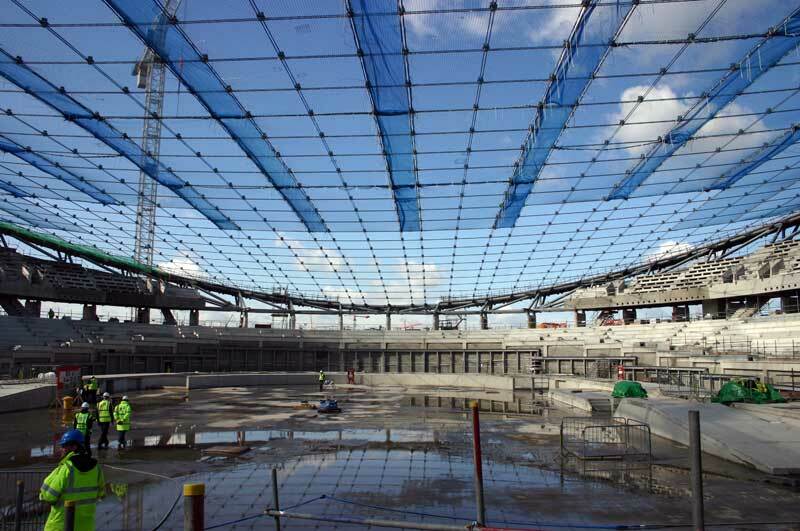 16km of cables have been used to construct the roof, weighing 100 tonnes alone. Designed in Germany, the cables were first laid out on the floor of the building, with the nodes that join them also affixed. The process took six weeks as tolerances for fitting the timber cassettes was just 1-2mm. 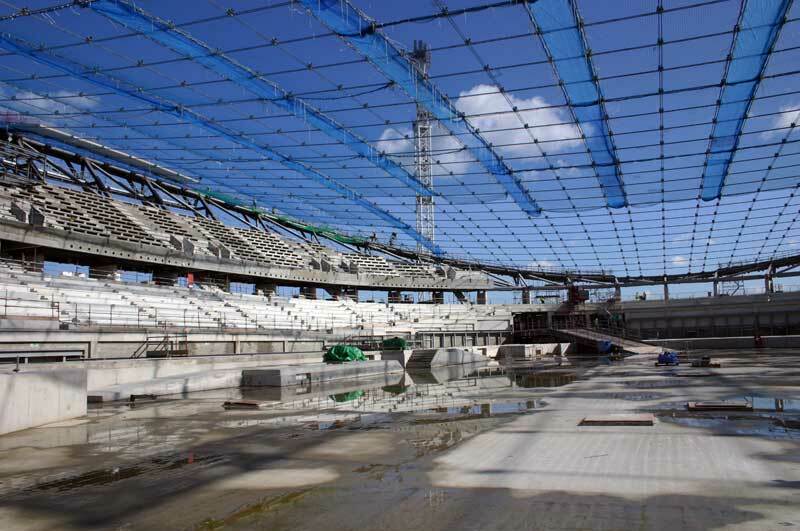 It then took another two weeks for the cables to be lifted in to position and tensioned. 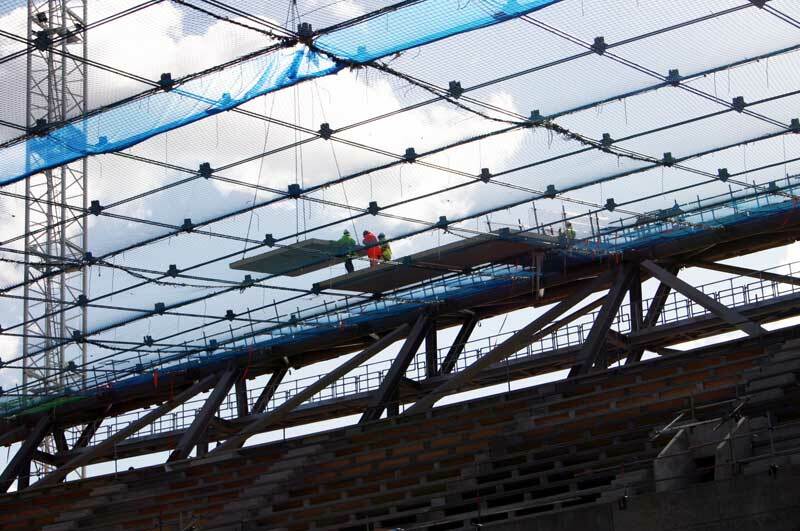 Strips of clear tiles will also be fitted to the roof to allow natural light into the building. The walls around the concourse level will be entirely glass for more natural light, although blinds will be fitted so sun spots can beam on to the track. An aluminium cover will eventually be fitted over the top of the timber cassettes to make the roof waterproof. Sir Chris Hoy was heavily involved in the initial consultation period, and, according to Olympic Delivery Authority Project Sponsor Richard Arnold, advised on three main areas. Firstly that there should be no change in airflow. To solve this problem, there will only be two entrances for spectators, and all entries and exits in the building have double doors. Secondly, Hoy wanted there to be continual seating around the track so that riders aren’t hit with a wall of noise in the straights and silence in the bankings. Therefore seating has been provided all the way round the track. Thirdly, Hoy said that toilets and the dope control area should be easy to access for the rider from the track centre, to avoid them having long walks during and after competition. The track itself will be delivered in July with construction starting in September. This is scheduled to take eight to twelve weeks and will be overseen by Ron Webb, the man who built Manchester and Newport tracks.